Sir, – Recent reports on the safety of re-building aircraft after a crash (Courier, January 4) suggest this to be a reasonable practice, though it is easily demonised. Certainly, it is only natural to re-use undamaged parts. In the days of steam, railway locomotives could exchange major parts: boilers, frames – sometimes even names and numbers, to the bafflement of train- spotters. In the First World War the Royal Navy famously combined the two undamaged halves of HMS Zulu and HMS Nubian to create a new ship, named with uncharacteristic Admiralty humour, HMS Zubian. 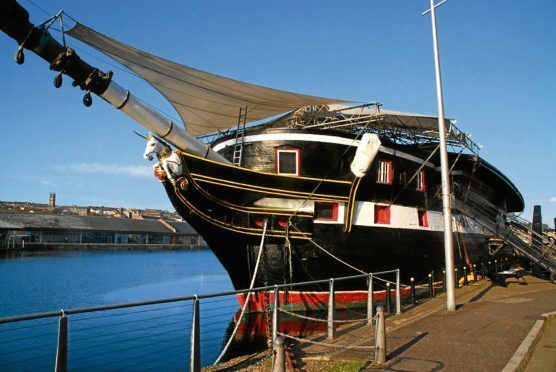 A dramatic Dundee exception to this common practice is our impressively original frigate, HMS Unicorn. Although launched in 1824 to strengthen the fleet worn out by the Napoleonic Wars, Unicorn was not needed for service at sea. Instead of being rigged, she was roofed over and placed into reserve, in which state she has remained to this day, without ever suffering the indignity of a major rebuild. HMS Unicorn is now recognised as the most authentic and least-altered of all the world’s big ships left from the great age of sail but her tranquil survival conceals a grand story of real service to her country: as the base for the Senior Naval Officer Dundee she even took the surrender of a German U-Boat at the end of WW2, surely a unique action for a sailing warship. Roderick Stewart, Dronley House, Dronley. Sir, – Correspondent David L Thomson (letters, January 4) while voicing his dissatisfaction with Scottish Government policies, makes a number of charges. The named person scheme he claims as being ‘unpopular’ (by unspecified groups) has the support of the welfare organisations involved. He claims our education system is ‘failing’ – and yet Scotland’s school children are viewed as some of the best educated in the world. His complaint regarding NHS Scotland is rather unfortunately timed, given the current meltdown of the Conservative-run NHS in England, and Labour-run NHS in Wales. The current state of the respective public services in the UK bring to mind Labour’s Lord Foulkes’ gripe during an interview, that the SNP were endeavouring to make Scotland’s public services better than south of the border. When asked if this was a bad thing, he reportedly replied: ‘No, but they are doing it deliberately’. Mr Thomson’s other complaints range from Scottish Government ‘spin doctors’, in a year which saw a 585% increase in David Mundell’s hospitality costs, and unspecified SNP junkets to ‘sunny climes’. Yes, I believe our First Minister was guilty of attending an October summit in Iceland, held by the UN’s Framework Convention on Climate Change. Shame on her. The presence of ‘many failed renewable schemes’ round off Mr Thomson’s list, oblivious to the many successes achieved in that field. In light of the Scottish Government’s limited powers and resources, courtesy of Westminster, his unhappiness at government cut backs can be more accurately and fairly addressed to Westminster. Mr Thomson would like to see ‘radical thinking’ and a ‘progressive Scotland’. Many believe an independent Scotland will deliver this and more. All it would take is the courage and the determination demanded by the gentleman. Ken Clark, 335 King Street, Broughty Ferry. Sir, – I made the mistake of watching Coronation Street on Friday, January 5, and I was suitably appalled by the inappropriate and unnecessary levels of violence shown pre-watershed. This included the use of a firearm. What once was a brilliant soap featuring good northern working class humour for all the family has now turned into a disgrace not suitable for younger viewers. This is not the first time in recent weeks a number of complaints have been raised. Are producers completely stone deaf when it comes to viewers opinions being voiced very loudly over social media? I have been watching the soap since 1980 and I am now turning off . I know many others are following suit. What has happened to the humour? I realise things change but to my mind this is a change too far – and for the worse. Gordon Kennedy, 117 Simpson Square, Perth. Sir, – Allan Sutherland (letters, January 5) calls for the creation of a new political party that would focus on value for money – hardly a political objective in itself. It begs the question, what value and to whom? Setting that aside, it is worth challenging the frequently repeated canard that the Greens won six seats with 13,172 votes in the 2016 Scottish Parliament election. Those votes won the Greens zero seats in the constituency vote. They stood in only three constituencies. The Greens’ six seats were earned by 150,426 votes in the regional ballot. The political system is far less forgiving to newcomers than Mr Sutherland assumes and small parties have to focus their resources wisely. James Christie, 2 Dryburgh Crescent, Perth. Sir, – The A&E departments in Scottish hospitals are under extreme pressure, especially at weekends, when the irresponsible drinking and partying crowd hit the various drinking establishments and then expect the NHS to treat them. In England 70 per cent of A&E attendances on Friday and Saturday nights are due to alcohol consumption. Doctors and nurses have long pleaded for action to get these social misfits away from A&E and into specialist drunk tanks. A friend had to go to A&E with a serious illness but was kept waiting whilst two drunks demanded immediate attention, claiming they were diabetic. Drinking too much is not an illness or an accident but a self-inflicted injury. The Scottish Government must lead the way in the UK and not only introduce drunk tanks but make a charge of at least £100 for the resultant overnight accommodation and treatment. Hitting these people in their pockets will have a more immediate effect than a lecture on alcohol abuse. Clark Cross, 138 Springfield Road, Linlithgow. Sir, – Nearly two decades ago my wife and I had the pleasure of visiting the new Guggenheim Museum with its striking architecture in Bilbao, Spain – it has made a huge contribution to the regeneration of that old city. Now, in 2018, thanks to the wisdom of city fathers, we have discovered what it was that was bothering us as we strolled around in the space outside the museum, admiring the seafront and impressive outdoor large sculptures. Mr R Brodie, 1 Duff Street, Dundee. Sir, – I read in The Courier that Perth and Kinross Council are trialling smart bins in the city centre, in an effort to cut down on waste and save money. These bins will tell them when they need to be emptied. Presumably this is something else that our council tax will pay for. Or is it the money they are going to charge us for our garden waste bins that will be paying for this new toy? I live in a small village outside Perth and we don’t get any of the things that Perth gets. We never have our streets cleaned like they used to be yet we are paying the same amount of council tax as the people in Perth. Back in November when I was leaving for work at 7.30am the roads out here were not salted even though it is a bus route. I thought that was why we paid council tax – we do not get the same treatment out here. E Marr, Perth Road, Abernethy.